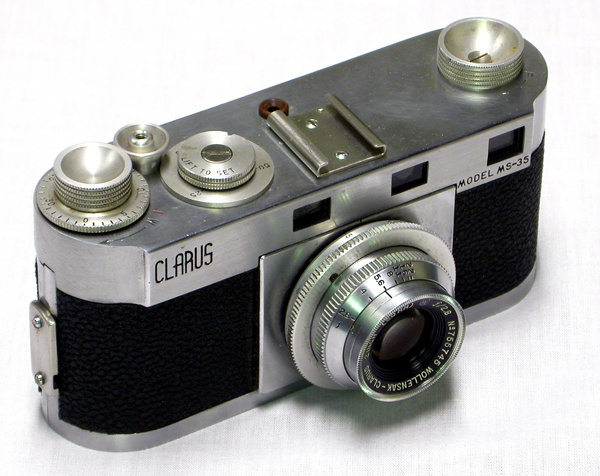 1946 - 52 Clarus MS-35 was a complete failure as a camera. Made by the Clarus Camera Manufacturing Company, this 35mm rangefinder camera had a tendency to have shutter problems from new. After it was too late, the company finally managed to get the cameras to work. However, their reputation preceded them and the camera sold poorly. The interchangeable lens is the f2.8 / .50mm Wollensak - Clarus standard lens.